Integrate HomeWorks QS with your iPhone®, iPod touch, iPad®† and Android devices†† and you can easily check the status of your lights, shades, and HVAC when you’re away from your home. Having whole-home control when you’re out of town or simply out for an evening provides a hassle-free way to save energy. Before you retire for the night, lower your shades, turn all the house lights off and set back temperature from the comfort of your bed with the “Goodnight” button. Not only can you control the lights that surround you, but also the lights halfway across your home—so you can rest assured no lights are left on, wasting energy. 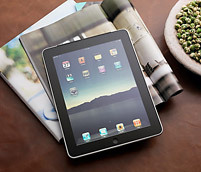 † iPad®, iPhone® and iPod touch are registered trademarks of Apple®, Inc., registered in the U.S. and other countries. †† Android is a trademark of Google Inc. Use of this trademark is subject to Google Permissions.